An effective run game and a quick passing attack can affect an opposing pass rush. Through the first several weeks, the Raiders’ run defense has been middling and this has resulted in some overall difficulty, including spillover struggles by the pass rush. While Ken Norton and the defense were busy trying to fix the gap assignment and eye discipline problems in the run game, the pass rush was falling off. What many fans had thought would be a strength of the team, led by potential Defensive MVP Khalil Mack, was disappointing. But in Week 7 against Jacksonville, the Raiders were able to mount more of a pass rush and make Blake Bortles’ season even more of a struggle. The ideal way to get pressure on the QB is to use a 4 man rush and keep 7 in coverage. This means that the 4 rushers must be able to defeat the 5, 6, and sometimes 7 man protections. The typically "straight 4 man rush" is to have 2 outside upfield rushers and two inside rushers, each attacking 1/4 of the pocket. This often leads to getting rushers pushed near each other and thus allowing the blockers to combine forces. It’s easier to pass protect if the blocker can get help to one side or another. One way to try to counter that is to flow the pass rush to one side and isolate one rusher on one blocker. Empty the side enough and it puts the blocker on an island with nothing but air on either side of him. In open space like that, the advantage shifts significantly to the more athletic pass rusher. Of course, if the defense opens up to much space, it creates an escape lane for the mobile QB, so there has to be some pass rush discipline and awareness. 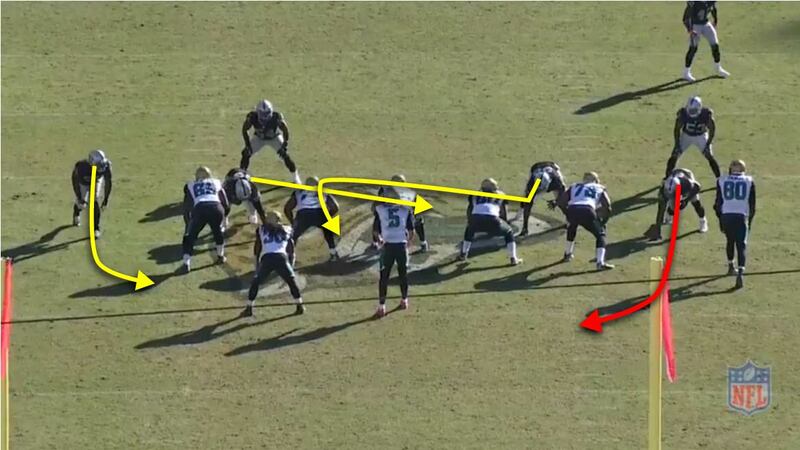 Here’s an example where the defense puts Bruce Irvin on an island against LT Kelvin Beachum. 1-10-OAK 21 (5:32) (Shotgun) B.Bortles pass incomplete short middle to A.Hurns [B.Irvin]. 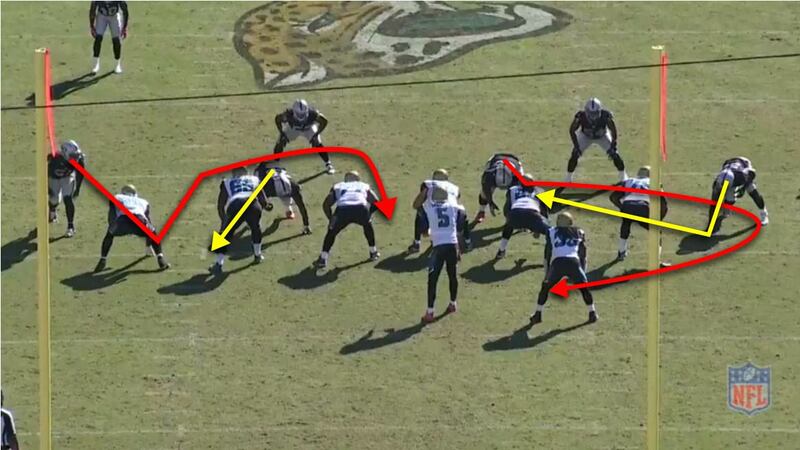 Jaguars have a 5-man protection with both the RB and the TE releasing into the pattern. Khalil takes an outside speed rush and Denico also hits it hard to the outside. The right side of the offensive line slides out and they have 3-on-2. Justin Ellis effectively plants himself in front of the QB and occupies the middle. This puts Bruce 1-on-1 to the outside. Bortles is right in the middle of the field while the three blockers are protecting the blindside from Mack and Autry. 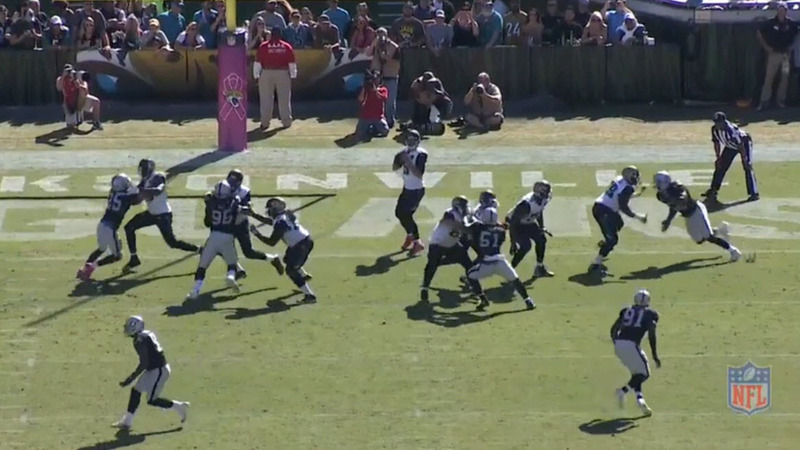 Jelly squares up with the LG Patrick Omameh right at the front of Bortles’ pocket. Bruce has that desired 1-on-1 with a 2-way go. Bruce is able to use multiple moves on Beachum, giving him a bump, then showing an upfield Rip move before spinning inside to make the near-sack on Bortles. Also, nice to have Khalil split the blockers and come thru late. 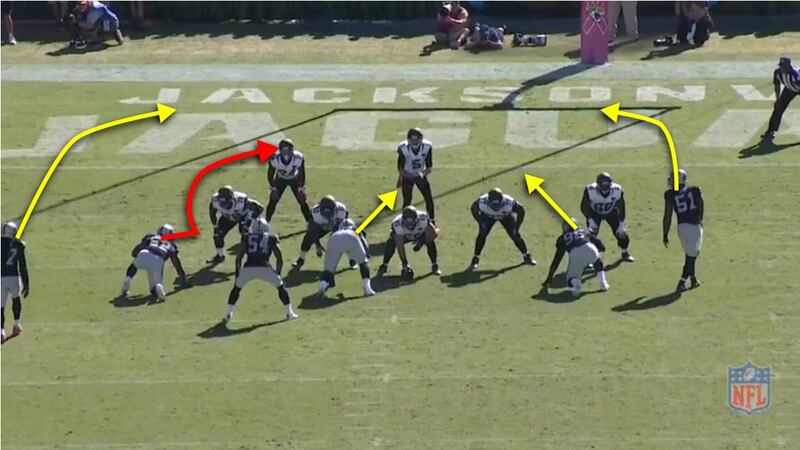 This time the flow of the blockers is going away from Mack to get him isolated on the RT Jermey Parnell. 1-10-50 (1:25) (No Huddle, Shotgun) B.Bortles pass incomplete short middle to C.Ivory. Stunts, especially violently active ones, force multiple blockers to coordinate themselves and act in unison to protect the pass rush lanes. A poor read or a slow reaction and a rusher can come completely free. This can also be very distracting. It requires such attention and focus that they may lose track of other potential responsibilities like helping on Khalil Mack. 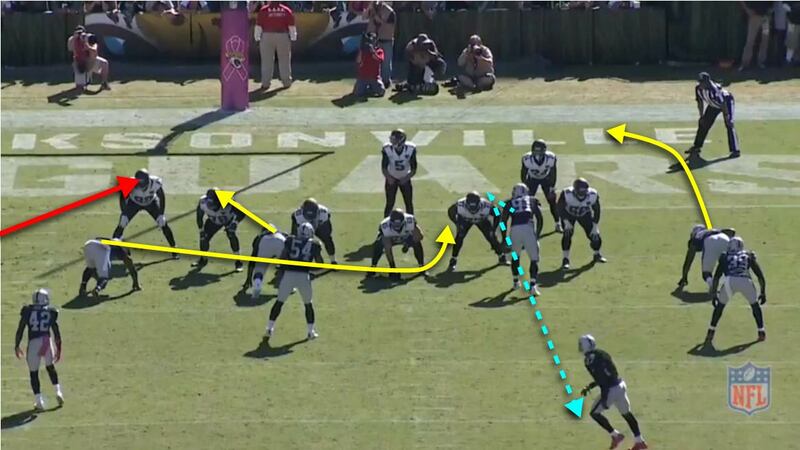 On this play, the Raiders run an inside stunt to draw the blockers and leave Khalil isolated on the outside. The RG AJ Cann and the Center Brandon Linder are busy handling the interior stunt. Cann follows Jihad all the way down, takes on Denico, and stonewalls him. It destroys the interior rush, but it gives Khalil a 1-on-1. 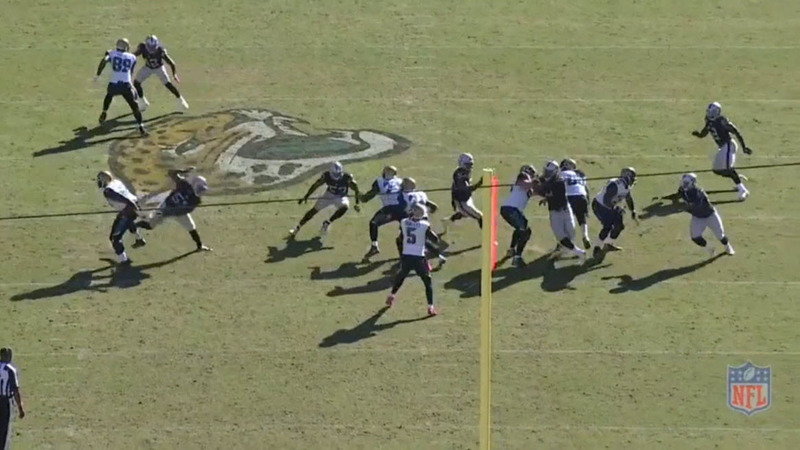 Bortles feels the outside pressure, thinks he has an open lane, and tries to escape. Mack puts on the breaks and makes the hit. Mack nearly has the sack, but Bortles manages to underhand toss the ball towards Chris Ivory for the incompletion. Every fan loves to see an effective blitz putting pressure on the QB, but Line Games are potentially just as disruptive without compromising coverage. Well executed stunts can put significant pressure on an offensive line, especially one that is still trying to build its chemistry or incorporate a new player. The left side of the Jaguars’ offensive line (LT Kelvin Beachum and LG Patrick Omameh) are both newcomers for this season. The Center Brandon Linder is a 3rd year player and RG is a 2nd year player. The RT Jermey Parnell is in his 2nd year with Jacksonville. It’s a good opportunity to try to stress their communication and synchronization. The Raiders defense used stunts quite a bit this game and to the OL’s credit (and also to their OL Coach Doug Marrone), they did a good job picking it up many times. 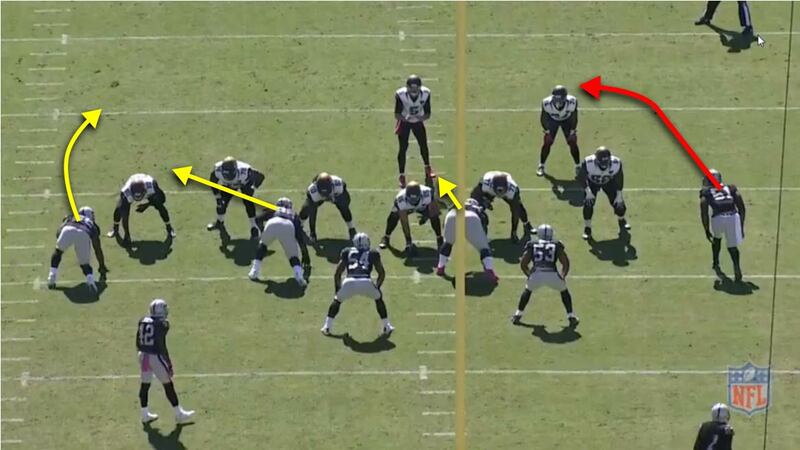 But on a few occassions, the Raiders were able to disrupt the pocket. 1-10-JAX 36 (10:29) (No Huddle, Shotgun) B.Bortles pass incomplete deep middle to M.Lewis (M.Smith). Stunts are the Pick and Roll of the football world and just like the basketball play, the goal is to get one man free. In a Stunts there is a "Pick man" and a "Looper". The first rusher is trying to set a pick (which is legal) on a blocker while the 2nd rusher is looping around to get free. On this play, the Raiders have two stunts. 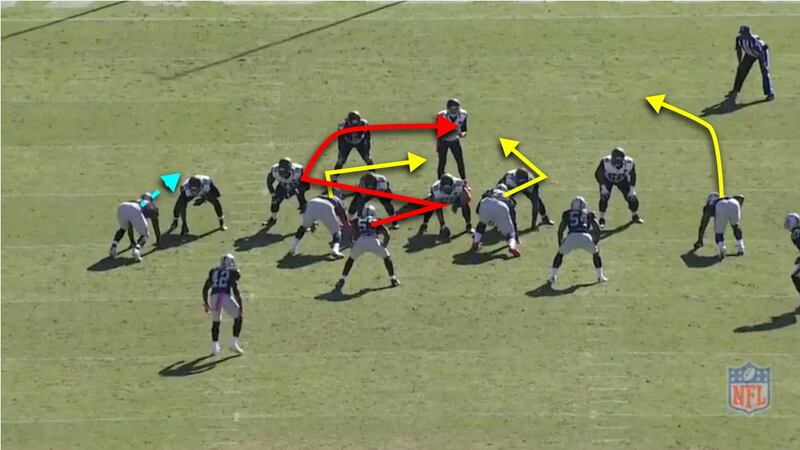 On the left side of the image, Darius is the Pick Man and Bruce is the Looper. This is called Tackle-End ("T/E") since the Tackle goes first and sets the Pick. Darius drives hard right up into the LT. Bruce starts an outside rush then plants his feet and loops inside. On the right side, Khalil takes an outside step and then crashes down hard on the RG while Dan loops around the outside. This is an "E/T" (End/Tackle) stunt since the End goes first. When Bruce starst his upfield rush, Kelvin Beachum slides out and focuses on him. This allows Darius a free shot at the LT. The LG is following Darius, which opens up a big hole in the middle for Bruce to loop into. On the opposite side, Mack has drawn all the attention and frees Dan up. But Dan is not so mobile and his slow loop allows the RT to recover. Latham does a nice job engaging the LT. The LG recognizes the T/E Stunt, but he’s turned his shoulders/hips and drifted so far outside that Bruce is easily able to burst inside. Khalil Mack’s combination of mobility, speed, and raw power makes him an amazing Pick Man on a stunt. Unfortunately, so far this year, the interior rusher has not been very effective at looping around Mack’s pick. But after the Jason Tarver years, Raiders’ fans are well aware of how poorly things can go on poorly executed / poorly conceived blitzes. Ken Norton is not a blitz-heavy coordinator, but he is also not a blitz-averse one. He mixes it in here and there and uses a variety of them. Here’s a look at 3 of them. 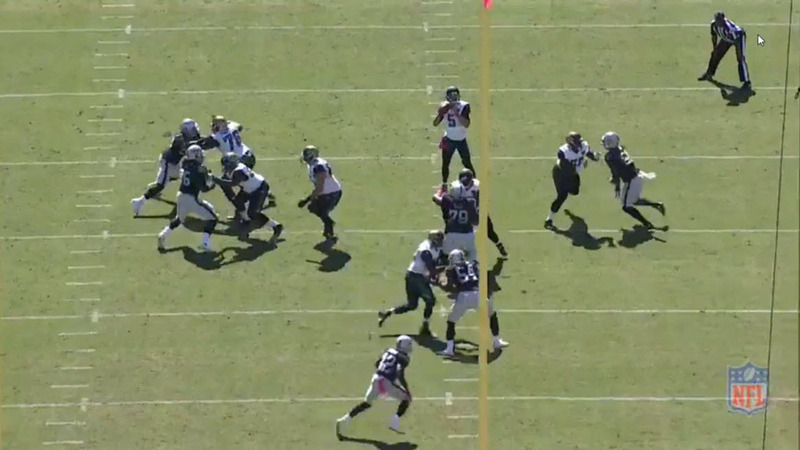 Ken Norton likes to use the interior LBs to blitz. Ben Heeny had a memorable one in week 1, Cory James, Perry Riley, and Malcolm Smith have all had their opportunities to rush the passer, sometimes in conjunction with each other. Here’s one with Malcolm Smith. 1-10-JAX 25 (2:28) (Shotgun) B.Bortles pass short middle to C.Ivory to JAX 28 for 3 yards (D.Latham). It will look like a 5 man pressure package, but Shilique Calhoun on the left is actually covering the TE throughout this play. The down-three rushers (Darius, Jelly, Khalil) will target their rush to the right, opening up a gap to the left side. 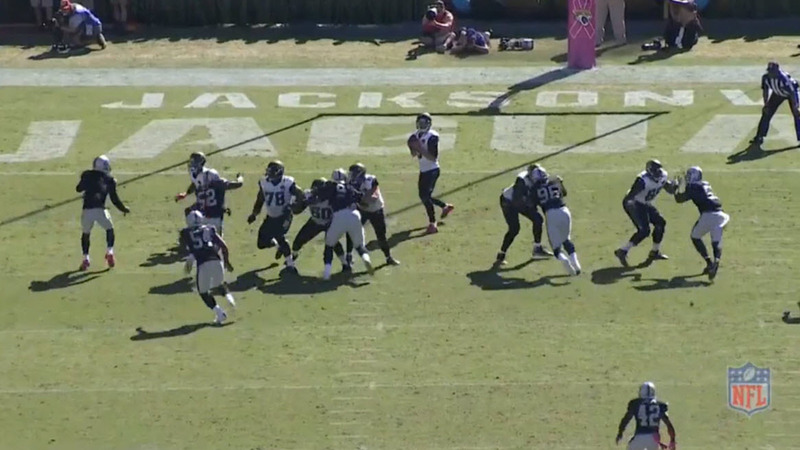 Malcolm flashes up the middle and then loops around Darius Latham and gets in to pressure Bortles. Chris Ivory steps up into the middle to pick up Malcolm’s blitz, but Malcolm is going to loop away from it. Karl Joseph will rotate down to pick up Ivory. Once Malcolm gets outside, there’s no one there; the RT is waiting for Shilique to do something. Jelly gives a nice push up the middle, but he and Khalil leave a small escape route. Bortles evades Malcolm just long enough to make the wild shovel pass to Ivory. A significant benefit of being a slot corner is being able to blitz the QB. Rarely does a CB blitz from the boundary because it just takes too long to get the QB even in the best of situations. DJ Hayden has had a very solid season and now he’s able to add blitzing to his repertoire. Here’s one that should have been a sack. 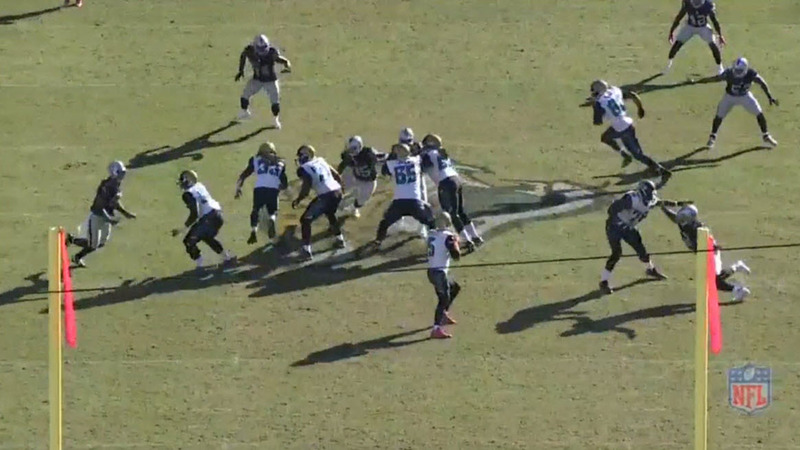 3-9-JAX 8 (8:35) (Shotgun) B.Bortles scrambles up the middle to JAX 9 for 1 yard (D.Hayden). Penalty on JAX-M.Lewis, Offensive Holding, declined. Shilique drops into coverage while DJ blitzes. This allows the defense to maintain 7 man coverage on the CB blitz. 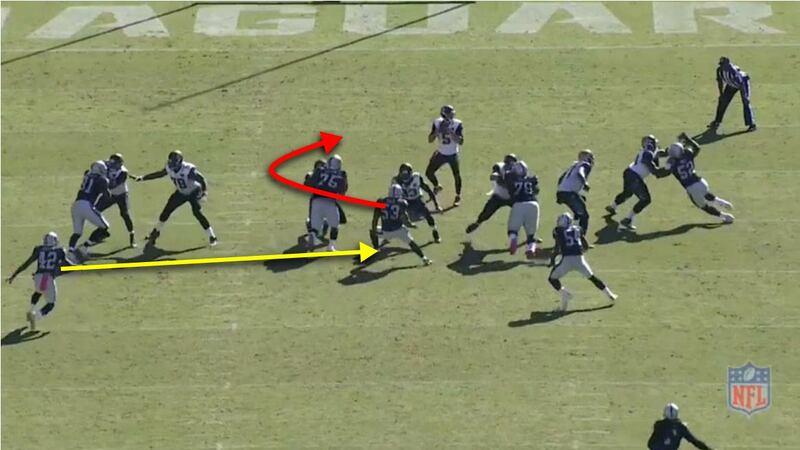 Bruce Irvin’s inside loop and Denico’s upfield rush combine to draw the right side of the offensive line to them. This leaves DJ Hayden clear on the outside with only the TE to pick him up (or the RB to come across the formation if the TE releases). The other important reason to have Bruce loop is to maintain pass rush lane integrity; someone has to fill Shilique’s rush lane. 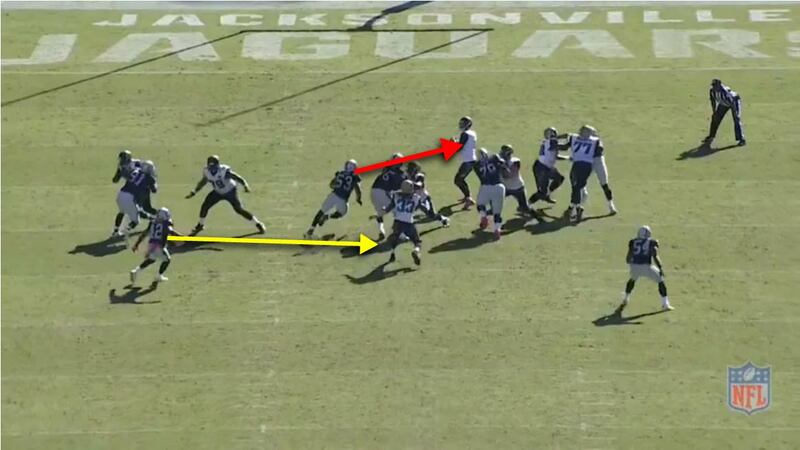 Nice rush lane established around Bortles. On the right side, DJ Hayden is picked up by TE Marcedes Lewis. DJ Hayden brings the power on the much taller and heavier Lewis. Hayden gets leverage and explodes into the TE, driving him back, and then breaking it off to go hunt the QB. Hayden gets the tackle and draws the holding penalty. Nice play. Not every blitz is necessarily designed to get the blitzer to the QB. In this case, we see that Ken Norton schemed a blitz in order to give Khalil Mack a predictable 1-on-1. 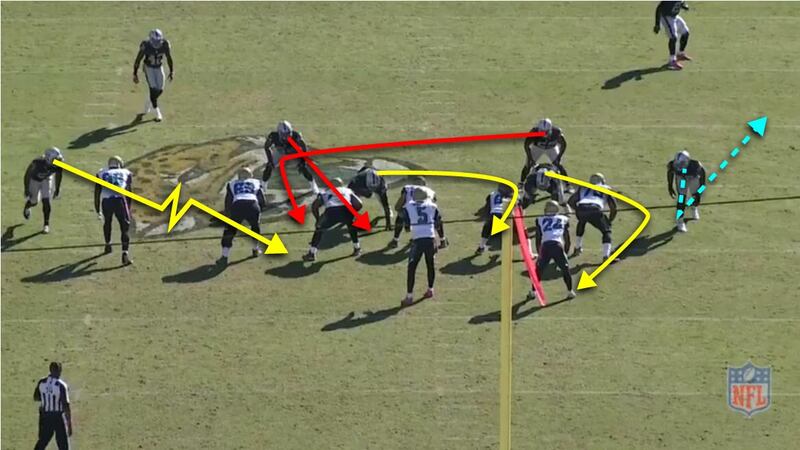 3-4-JAX 12 (5:27) (Shotgun) B.Bortles sacked at JAX 5 for -7 yards (K.Mack). RB is offset to the right side and (likely) available to chip or double on Mack. Reggie Nelson times it up and drops down to the line of scrimmage to blitz off the edge. Reggie takes an outside rush to draw the RB. Jihad attacks upfield to engage the RG (including using a little bit of a hold with his left hand). This to ensure that the RT has no help. 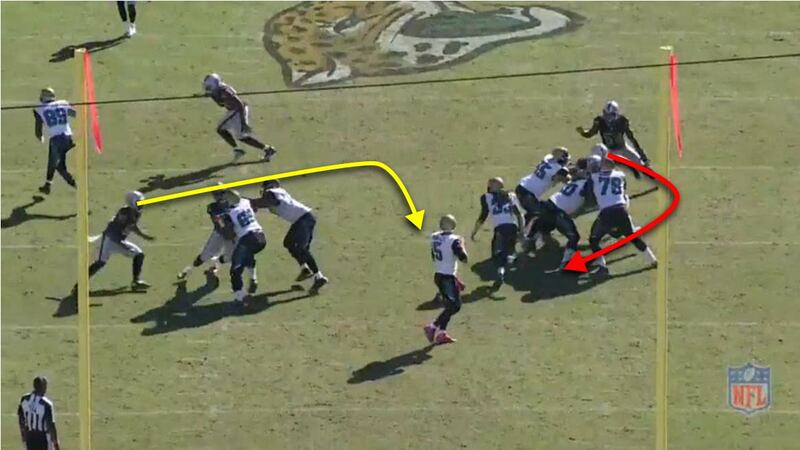 Bruce and Denico’s disciplined attack on the opposite side establishes a backside wall so that Bortles cannot escape. Khalil explodes out of his stance with a hard step inside. He then loops to the outside, turns the corner, and closes in for the kill. Reggie blitzing to the outside forces the RB to pick him up. Jihad inside is taking on the RG. Mack is swimming and then ripping with his arms, but the RT is beaten so badly that he’s not even close enough for Mack to have to clear the arms. And sometimes Ken Norton brought multiple things to the party. Here, he has a Cross Dog blitz, an isolated edge rusher, and drops Khalil. 1-10-JAX 46 (5:42) B.Bortles pass incomplete short left to A.Benn (S.Smith). Mack fakes the rush and then drops into coverage. This draws the RB momentarily to make him a touch late crossing the formation to pick up the blitz. Denico and Jihad shoot to the outside to clear the middle. This leaves one lineman (plus the RB) and two blitzing linebackers. On the backside, Bruce has a 1-on-1 with LT Kelvin Beachum (who was having trouble all day). Bruce gives a shake move and gets free. Bruce is free and Beachum may or may not realize it yet. Perry actually comes completely free with both the LG and the RB taking Malcolm, but unfortunately Perry gets bumped a little too far inside and can’t get to Bortles. #24 TJ Yeldon tracks Mack before breaking to the inside. It shows how opponents are scheming for Mack and now we are seeing a little bit of how Ken Norton is trying to use that to free up others. Closer look at how Perry and Malcolm are coordinating their Cross Dog blitz. Of the LB combinations, Malcolm + Cory James looked the best and most synchronized on these Cross Dogs. It’s nice to play with a lead when the opponents have given up on the run game. It’s nice to play against a newly formed OL unit. It’s also nice to play against a struggling young QB. The Jacksonville Jaguars’ offense struggled on their own all day and it gave the Oakland defense an ideal opportunity to work on improving their pass rush. For the most part, the pass rush was able to do much more this day than they had previously and it looks like there has been some solid growth among the players since Week 1. It is still definitely a work in progress. There are clearly some areas that need work, notably the interior rush where the various combinations of Jihad, Denico, Dan Williams, Jelly, Stacy McGee, and Darius Latham have not been able to get a consistent inside push or disruption to make things easier for the two edge rushers. As a result, opponents have used many tactics to slow down both Khalil and Bruce. There may be some cause for optimism, though. Jihad Ward is growing up and just his pass rush attacks and his routes in stunts has improved so much in the past 3 games. Mack and Bruce are starting to find some success and Ken Norton is continuing to try to scheme to free them up. Really liking this presentation style.